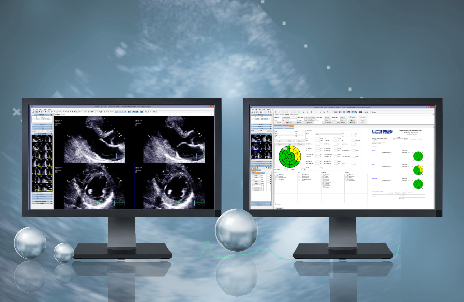 MediMatic offers a vendor neutral cardiology workflow solution for your Echo lab, providing a fully automated digital workflow. Through a bi-directional integration with the HIS/EMR system, ComPACS facilitates worklist distribution, archiving, image review, advanced analysis and reporting, enabling stress echo reports to be automatically available in the hospital’s electronic patient record. Integration with the Hospital Order Entry system will provide Modality Worklist distribution to the echo machine, allowing the operator to easily set up and start the case. Echo images and loops, as well as measurements performed on the echo machine during the stress echo, are captured during the procedure and securely stored to the ComPACS archive. After the stress echo examination, the study is immediately available in ComPACS for the physician to review, analyze and report the echo study. The complete Stress Echo protocol that was used during the examination, with views and levels, is preserved as part of the image data stored, which allows the stress echo study to be reviewed in ComPACS organized in the original protocol. ComPACS provides reporting templates for both Exercise and Pharmacologic stress echos. A complete stress echo report is easily created based on the desired template, with Wall Motion Scores and key physiological parameters calculated for each stress level. Including structured findings based description of ECG, Echo, Symptoms and Theraphy. All anatomically specified measurements automatically populate into the report worksheet and final document to save you time and eliminate potential transcription errors. Both Analysis and Reporting can be fully customized to meet your specific workflow needs. Streamlines workflow by enabling physicians to view, complete and sign echo reports from the hospital, office or home. Using the Echo structured reporting tool enables confirmed and electronically signed reports to be automatically routed directly to the HIS/EMR, making the Stress Echo report generated in ComPACS directly available in the electronic patient journal as a platform independent document.